A flattened cake of powdered dried cashew nuts soaked in condensed milk is known as Kaju Barfi and this is often synonymous with all our happy moments. 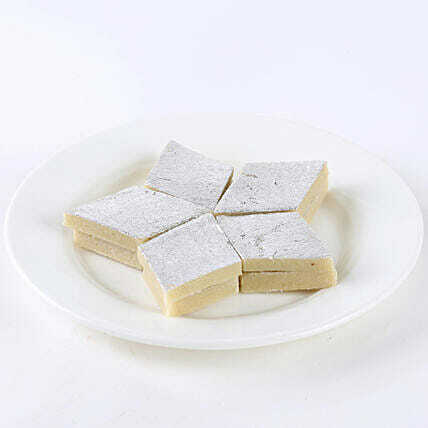 So, wish your loved ones on any special day with this packet of 250 grams of Kaju Barfi. "Its always a great experience with fnp. I m loving it!!" "I have been using Ferns N Petals since almost 3 years and it's been such an amazing experience. I have sent flowers/cakes/sweets across cities such as Howrah, Bhubaneshwar and ofcourse, Bangalore,..all my experiences have been great. Their products are fresh, reliable and they deliver on time. 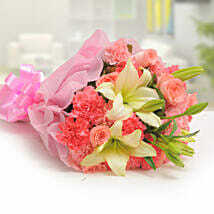 I will continue to use Ferns and Petals and would also recommend them to people whom I know. Great Job Guys!!!!! " "Products and service are excellent and upto the mark. One disappointed thing is that our written messages are not given in the card. So please write our personal messages on the card too." "add more options for haldwani"
"timely delivery is best service"
"Range of products could be improved "
"Gifts Reach on time. " "It was a nice Experience , Thanks Team :)"